More stuff for the Spankys Spanking Shop. This is going to be a featured picture set, I have nearly finished drawing most of the stock & have nearly put it in the shop. We now have, a try before you buy cane and whip rack, spanking mag rack, a selection of scaled spanking action figure sets, some cute uniforms & dresses, the NEW Auto-Cane machine and a set of spanking benches. 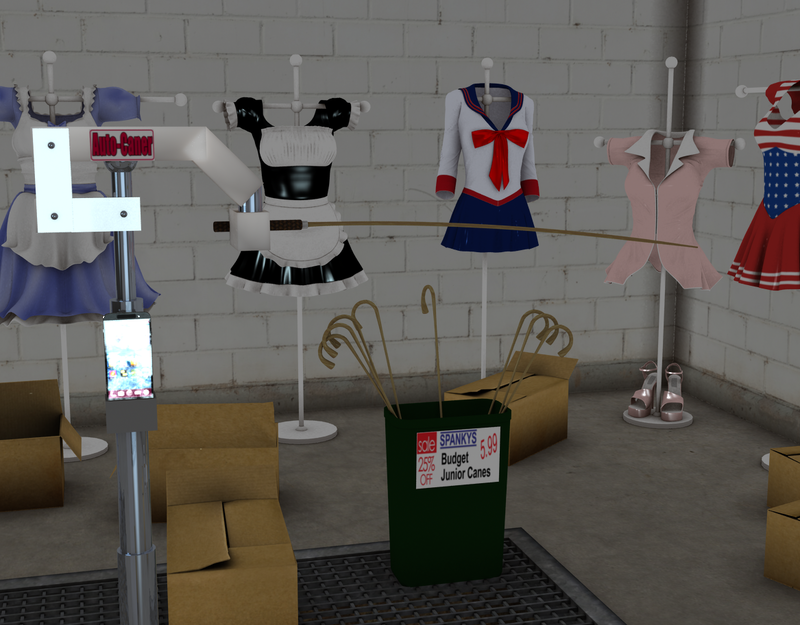 I am now about to work on the staff and their uniforms 🙂 The caning machine ” Auto-Caner” works from an App on your smartphone. Programmable new technology with auto adjusting height & angles. You can use the App to program the Auto-Caner to deliver a sound thrashing of as many stokes per minute or to deliver variety of stokes. You can adjust the machine to start more softly and get harder and also program breaks into the punishment. The demonstration model is fully functioning with a smartphone in the “docking Station” . You may also purchase additional packs to use other implements such as paddles and riding crop. The Auto-Caner also runs off a battery which is rechargeable (separate batteries can be supplied) or you may run it off the mains electric.